Prized exotic woods have been royal trophies of opulence for centuries. These cherished woods are used to create furniture, carvings, flooring and accent pieces. These woods are found around the world and may be rare. Plan on budgeting more for exotic wood choices. East Indian Rosewood (also known as Indian rosewood) is one of the most popular of several types of rosewoods. East Indian Rosewood has good availability unlike other rosewoods that are endangered wood species, such as Honduras and Burmese. While East Indian Rosewood is listed as a "vulnerable species" suffering from a 20% reduction over the past decades, you can still find it in many home furnishings. If you desire rosewood, this is the best choice. Know the details before you make this wood your choice. Appearance: Known for its violet and purple color with streaks of light black, it is medium to high density with an interlocked grain. It naturally darkens with age to a deep brown. Strength: Its mid- to high-density often makes it difficult to work with tools, but it's easy to turn. East Indian rosewood is used to make all types of furnishings as well as acoustic guitars. 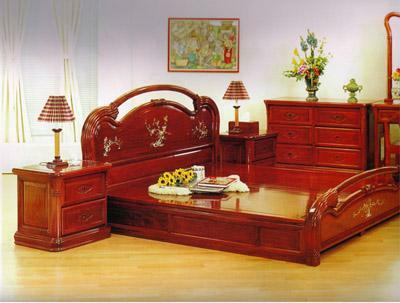 Boards: The boards are used to make fine furniture, cabinetry, and various fine furniture pieces. Turning blank forms: Used to create table legs, bowls, and other objects by machines or hand-carved. 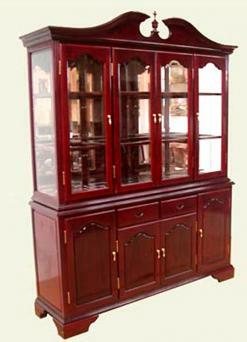 Solid wood furniture pieces imported from India often feature hand-carved motifs and trims. Dining tables, buffets, and sideboards: Solid pieces of furniture are available in numerous styles and price ranges. Monkeypod is found in Costa Rica and also known as raintree pod, saman, and monkey wood. It's easy to hand carve and cut with machine tools. Get the look you want for your project in a mid-to-high price range. Appearance: Monkeypod is dark chocolate and gold mixed with black striping and a typical straight grain. Strength: Since the wood is "moderately hard" it's also fairly strong and lightweight. Monkeypod is an excellent choice for furniture, turned pieces, and commonly used for guitar and ukulele construction. Wood slabs and planks: Large slabs are used to make tabletops for dining tables. Smaller wood slabs are fashioned into coffee tables, benches and end tables. Some pieces are milled into lumber planks for furniture use. Veneers and cabinetry: Makes excellent veneers for furniture and building cabinetry. Look for tables made from this exotic wood. This West African wood is prized for its zebra stripe effect. Also known as Zebrano, most of the wood used in furniture is veneers. The memorable wood is one of the more expensive exotic options. 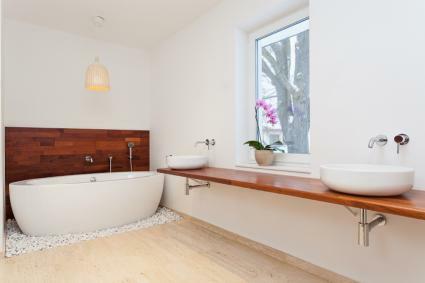 Appearance: This wood is very striking. The heartwood light brown to cream colors are streaked with black and brown giving its name. The stripes vary from wavy to chaotic. 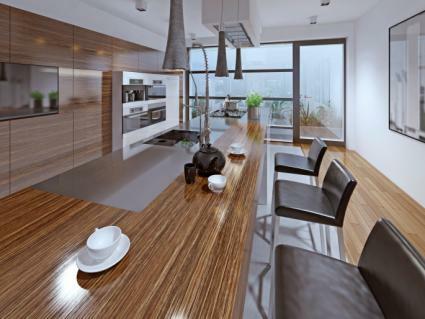 Zebrawood has many uses for home furnishings, including veneers and solid wood furniture. Flooring: Zebrawood is "considerably harder than Red Oak and Northern Maple" and used for stunning floors. Available in solid planks ($24/sq ft). Tulipwood is found in Northeastern Brazil. It's an exotic wood but isn't listed as an endangered or threatened species. Very few new pieces of furniture are made. Most pieces are found in antiques. Appearance: This wood is a mixture of yellows, oranges, reds and pinks streaks. Its beauty is being highly variegated in these colors. Tulipwood boards/planks are rarely available. Aside from being used to create home furnishings, this wood is also used to make percussion instruments (percussion). 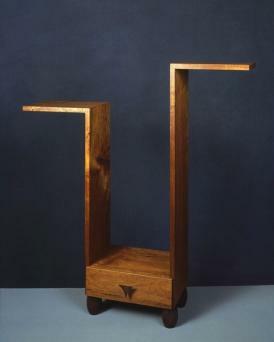 Woodworkers can purchase small amounts of Tulipwood for projects. 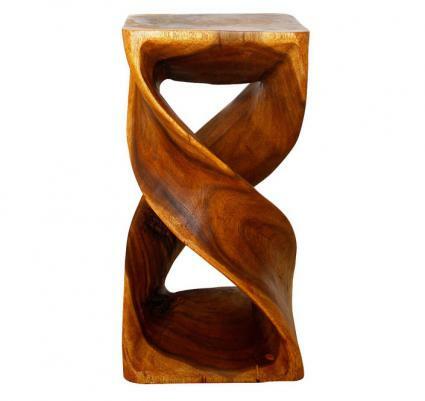 You can find several small objects made from Tulipwood to use as accessories for your home décor. 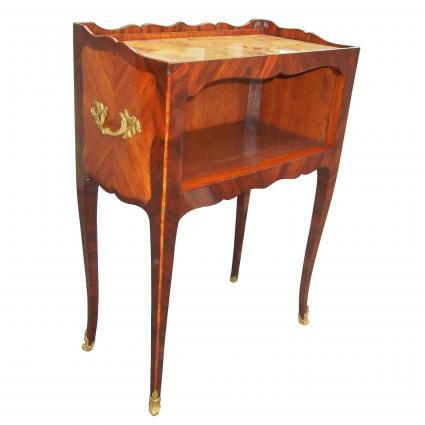 Furniture: Period furniture, such as a Bombay chest ($2,995), a Louis XIV commode ($12,250) and other antique pieces. Decorative objects: You can often find hand-crafted boxes, bowls, trays and other objects by contemporary artisans and craftsmen. Tasmanian Blackwood is found in Australia and also known as Australian Blackwood. This species is gaining popularity with woodworkers to replace the Hawaiian Koa species that is difficult to find due to the supply and demand. Tasmanian Blackwood is considered an invasive species that makes it highly sustainable unlike Koa. This availability isn't reflected in the cost. Appearance: Unlike Koa, Tasmanian Blackwood doesn't have the same kind of reds and golds, but it is in the same brown family. The coloring can be highly variable. The golds tend to be a medium hue and the browns lean towards reddish. The wood often has darker narrow bands (growth rings). The grain is typically straight, although it can be wavy. The wood is milled to be used for flooring, furniture and other objects. Planks: The boards are used for furniture and flooring. This wood can be used for many areas in your home. You may decide to replace the kitchen granite countertop with a wood one or replace worn flooring. Furniture, decorative objects and veneers are other choices you may consider. There are many species of exotic woods and the popularity continues to grow. Adding one piece to your home can be just the right touch for your décor. The best way to help offset the endangerment to these wood species is to shop for items made from reclaimed lumber and used/antique furniture.